The Siamese cats originate from Thailand (formerly known as Siam), where they are one of several native breeds. There they are called Wichian Mat (วิเชียรมาศ, “moon diamond” ). lilac (diluted chocolate, pinkish gray). Also, there are red, cream, caramel, apricot, cinnamon, fawn, tortoiseshell, lynx (tabby) patterned and white Siamese. All Siamese have blue eyes. About 50 years ago, Patricia Turner, a famous cat geneticist, saw an overdeveloped photograph of a lilac point Siamese. It is said that that photo gave her the inspiration to start up a breeding programme for a fully white coloured Oriental typed cat with blue eyes which would not be deaf, as many other completely white cats with blue eyes are. On November 5, 1962, cat breeders in England started a breeding program, in which they started crossing dominant white British shorthaired cats and seal pointed Siamese. That was the foundation of the Foreign Whites – white Siamese. Siamese kittens are born white. They may look all white and pink in first days of their life, but then they start developing dark ear edges and nose tips. They will fully develop their point color as they get older. 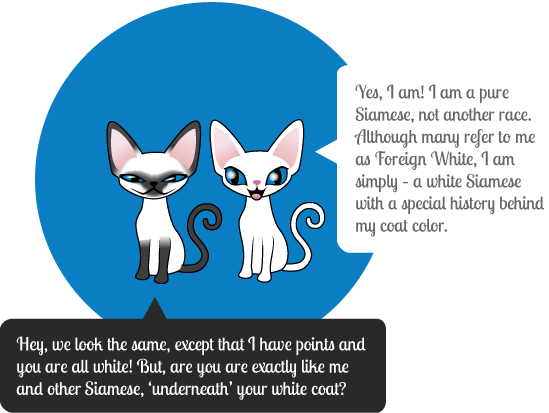 The pointed Siamese pattern is a result of the partial albinism gene (Himalayan gene). The point restricted pattern is bound to an enzyme which, when exposed to temperatures above 37°C, causes the hair root to produce little or no pigment for the growing hair. That is why the Siamese kittens are born completely white – it is very warm in mom’s belly! The neck and the body of the cat are warmer and don’t develop any or little pigment at adult Siamese. Their point color is restricted to the areas of the body that are cooler, such as the face, ears, legs, and tail. But, if your Siamese is a bit overweight, a layer of fat works as an insulator and the cat can become darker in its body also! Genetically, a seal point Siamese is a black cat! But the Himalayan gene inhibits the full expression of the pigment, so what you see is a seal point – a cat with creme colored body and dark brown points (legs, tail, ears and face). Siamese cats can have the bluest of all blue eyes in cats. That is the result of the pigment reducing effects of the albinism allele combined with a low inherent amount of pigmentation. 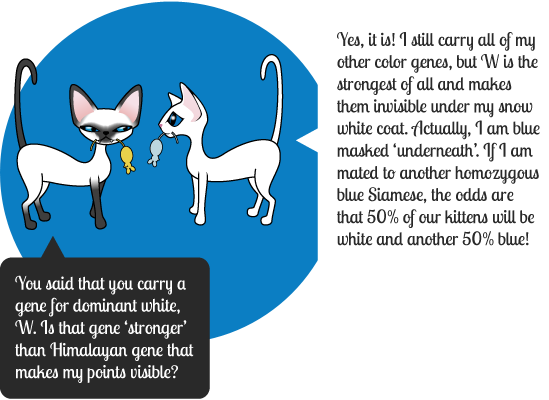 Thus, if your Siamese has a very deep blue eyes, the chances are that they are carriers of gene for green eyes. Pale blue nuance point to the copper colored eye color “under” the blue eye color we see. In non-Siamese white cats we can see two kind of eye color: non-pigmented eyes (the so-called white-blue eye), or pigmented eyes (green or copper). Tapetum lucidum is a layer of tissue in eyes of many mammals, including cats. All pigmented eyes have tapetum lucidum, none of the white-blue eyes has. Siamese albinism allele makes copper or green eyes ‘under’ appear blue. 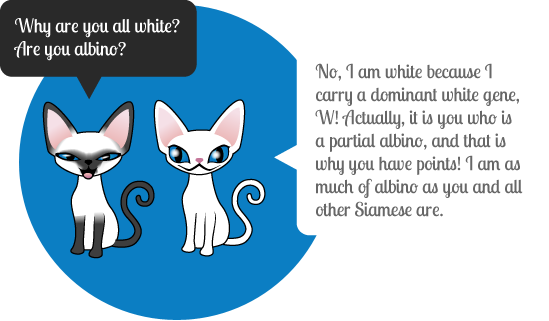 So there are two different groups of blue eyes in white cats: the white-blue eyes that usually occur in dominant white cats (with the gene W) without tapetum lucidum, and the Siamese blue eyes of the Siamese cats with tapetum lucidum. Deafness in white cats is caused by an absence of a cell layer in the inner ear. Tapetum lucidum is generated from the same stem cells as the inner ear tissue melanocytes (pigment cells). Siamese albinism gene protects that tissue from being destroyed. The white siamese (Foreign Whites) are white cats that both can hear and have tapetuum lucidum present in their eyes. If you have a white cat with blue eyes, from the age of 4 months tapetum lucidum can be clearly recognised and checked by a veterinary. Ocular pigmentation in white and Siamese cats, Thibos LN, Levick WR, Morstyn R.
Guillery RW, Hickey TL, Spear PD. The dominant white gene is the ruler in the world of dominant genes for color. It trumps all other genes for color, no matter if they are dominant or recessive. So with the dominant white gene present, the black, chocolate, blue, lilac (or – any color) cats all become the same color – white. You can perform a simple DNA saliva test on a white cat and see what color it carries. For example, you can do it here. We mentioned the foundation of white Siamese, from England. The story is much longer. Another line of Foreign White was started in parallel, in Ireland. Red point Siamese was crossed with white British shorthairs. That line didn’t make it since the offspring exhibited too many defects, like the Waardenburg-syndrome, sterility and various health problems. The Waardenburg-syndrome is inherited irregular dominant and is the cause of pigment anomalies of the eyes (the lack of tapetum lucidum in the eyes), skin and fur and disruption of hearing (partial or total deafness). Foreign White matings to Siamese carriers of red pigment (red, tortoiseshell, cream and apricot) are not allowed as they appear to attract the Waardenburg syndrome. Matings to tabby (lynx) point Siamese is not recommended because freckles may appear on nose and lips. 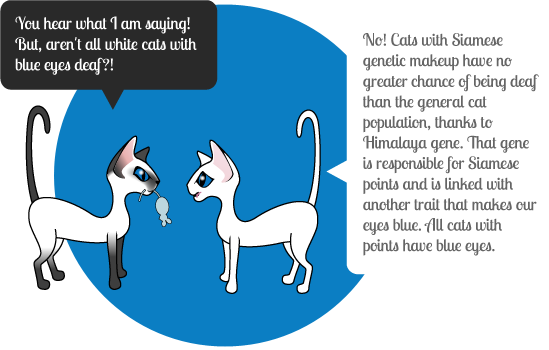 Foreign White x Foreign White mating can only be allowed when both cats have proven to have Siamese-blue eyes (are carriers of Himalayan gene). 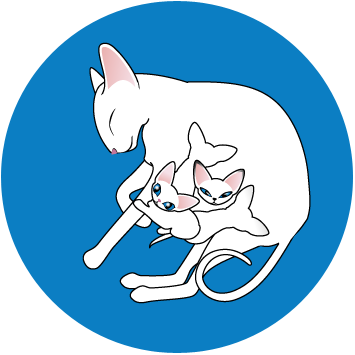 Lilac, Blue, Seal or Chocolate point Siamese x Foreign White mating is the rule that will give us the healthy, hearing white Siamese offspring.